Q. How long does it take to see the butterflies? A. A 30 minute guided tour is included in the admission price however you are free to explore on your own and so allow 20 minutes to see all the exhibits or you can stay all day. Q. What time is the next tour? A. Tours operate upon request, so if you can’t join up with one that has just started, you wouldn’t have to wait longer than 15 minutes for the next one. Q. Will the butterflies land on me? A. If they want to – we can’t force them to do anything however they are attracted to bright colours so make sure you wear bright coloured clothing to increase your chances. Q. What colours attract the butterflies? A. Colours that look like flowers – including red, white and pink are popular with the butterflies. Q. Do you offer discounts on the admission price? Q. Can we still visit the sanctuary if it is raining? A. Yes, we are an all-weather attraction. Q.Is it hot and humid in the sanctuary? A. We do not need to use artificial heating because our tropical climate is natural enough for our butterflies to fly, eat, mate and play! It can get very warm in summer, so we recommend that you drink lots of water during your visit. Q. Can we eat in the sanctuary? A. No, regrettably we cannot allow food or sugary drinks into the aviary as it attracts ants and other predators that may harm our butterflies. Q. Can we come back later in the day or on another day? A. Yes, we can issue you with a re-entry pass that allows you to return during the same day or on another day/s while you are in the area (to be used within a month). Open daily from 9.45am to 4:00pm. The Australian Butterfly Sanctuary is located at 8 Rob Veivers Drive, in the heart of Kuranda Village only half an hour from Cairns in Tropical North Queensland, Australia. A free shuttle service operates from the Kuranda Skyrail Terminal and the Kuranda Scenic Railway Station to the Australian Butterfly Sanctuary, or it is only a short walk. You can also book a coach tour to the Australian Butterfly Sanctuary or hire a car and self- drive. There are a range of Kuranda tours with Tropic Wings Cairns Tours & Charters that incorporate the Australian Butterfly Sanctuary in their itinerary. Departing Cairns accommodation, travel North on Sheridan Street. As you pass the airport on your right, Sheridan Street becomes the Captain Cook Highway. You will soon cross the Barron River Bridge. Continue through the Machans Beach, Holloways Beach and Yorkeys Knob and Caravonica roundabouts. At the Smithfield roundabout turn left onto the Kennedy Highway, passing Smithfield Shopping Centre on your right and join the Kuranda Range. You may wish to stop at Henry Ross Lookout for a scenic view of Cairns and the coast. From Henry Ross Lookout, continue on the Kennedy Highway, passing over the Barron River Bridge. Follow signage and turn left into Kuranda Village. Turn left at Rob Veivers Drive to arrive at the Australian Butterfly Sanctuary. If you still have questions that we haven’t answered, please don’t hesitate to contact our friendly team at ulysses@australianbutterflies.com or call us on Ph: +61 7 4093 7575. Visit our gift and souvenir shop and check out our range of clothing, books and souvenirs for you to buy as a gift for family and friends or just to remember the magic you experienced at the Australian Butterfly Sanctuary. There are numerous local cafes and restaurants just a few minutes walking distance from the Australian Butterfly Sanctuary or why not visit Rainforestation Nature Park which is only a 5 minute drive and operates three restaurants and a snack bar. There are 30 minute guided tours through the flight aviary and presentations conducted regularly throughout the day. Click here to view our prices for entry and activity packages. Three hour parking is available across the road from the Australian Butterfly Sanctuary and around Kuranda Village. 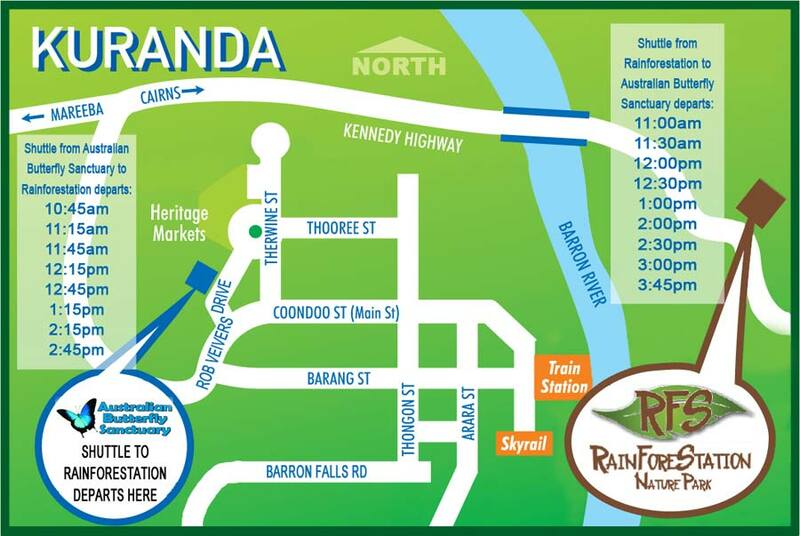 All day parking is available in the Kuranda library carpark (which is a short 2 minute walk) which also caters for caravans and campervans. The Australian Butterfly Sanctuary is available for hire to host special occasions including weddings and ceremonies which incorporate butterfly releases. Visit our Bookings page for information on entry, tours and packages. While you’re in Kuranda, why not visit our sister park, Rainforestation Nature Park? You can catch the regular shuttle bus to Rainforestation, departing from right outside Australian Butterfly Sanctuary. Prices are $7.50 one-way or $12.50 return for Adults, and $3.75 one-way or $6.25 return for Children. $31.25 return for a family (2 adults, 1 children).